Seniors: We have been challenged to reach 400 donors before commencement in spring 2019. If we reach our goal, we will get an emblem placed along Niner Walk near the stadium dedicated to the class of 2018-2019. Make your gift today to support current and future Niners! 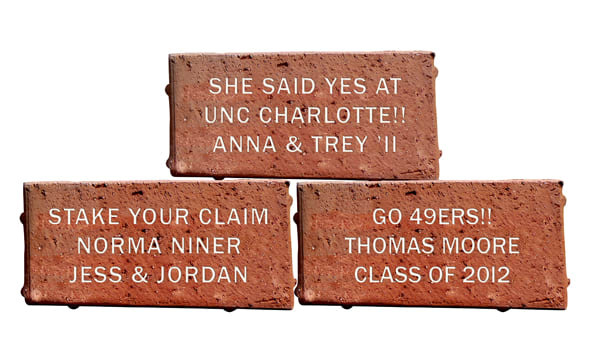 This year, the Class of 2018-19 is staking their claim through a brick campaign to benefit the Emergency Relief Fund. 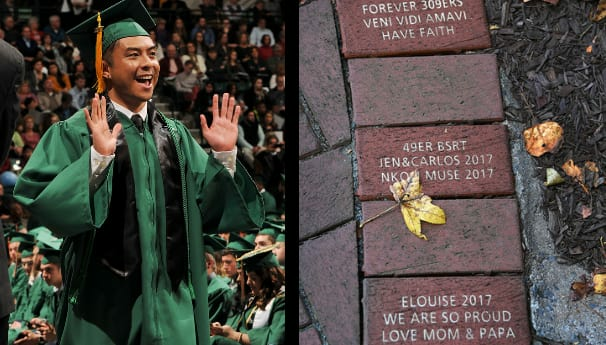 Every gift of $49 or more, made by or on behalf of a graduating senior, will be honored with a personalized brick in 49er Way. We need your help in donating to this fund! UNC Charlotte's Emergency Relief Fund is awarded to students experiencing hardships that come along with unexpected emergencies, this fund will provide scholarship assistance so that students and their families can focus on recovering and rebuilding. A scholarship like this one, makes education and career goals easier to obtain. Your support of the Class of 2018-19 Fund gives fellow 49ers a future to believe in. 49er Way is a brick walkway located between Cameron Blvd and Jerry Richardson Stadium and is the path the team, the band, and many alumni, students and fans take from the Hauser Alumni Pavilion to the stadium during home football games. It is also one of the most traversed and most photographed, routes on the UNC Charlotte campus.